The Roman emperor Gaius, more commonly known by his nickname Caligula, ruled from A.D. 37 to 41 and was extremely unpopular. In fact, after he was murdered, almost all portraits of him were destroyed. The Romans had a long tradition of portraiture, but portraits of emperors had a specific propaganda function beyond that of ordinary portraits. The actual appearance of the individual was combined with the political message that the portrait was meant to convey. Portraits of Caligula show a young man with a high forehead, small mouth, and thin lips. He is identifiable as an individual, yet his hairstyle copies that of the emperor Augustus, making a deliberate allusion to his dynastic connection and his right to rule. Height: tall -- Complexion: pallid -- Body: hairy and badly built -- Neck: thin -- Legs: spindling -- Eyes: sunken -- Temples: hollow -- Forehead: broad and forbidding -- Scalp: almost hairless, especially on top. Because of his baldness and hairiness he announced that it was a capital offense either for anyone to look down on him as he passed or to mention goats in any context. Mohammad Yeganeh (Frankfurt, Germany), sold to the J. Paul Getty Museum, 1972. Gallery of Greek, Roman and Byzantine Art advertisement. Apollo 90 (December 1969), lxxx, ill.
Jucker, Hans. "Caligula," Arts in Virginia 13, 2 (Winter 1973), pp. 16-25, p. 20; fig. 13. Fredericksen, Burton B., Jiří Frel, and Gillian Wilson. Guidebook: The J. Paul Getty Museum. 4th ed. Sandra Morgan, ed. (Malibu: J. Paul Getty Museum, 1978), p. 61. Inan, Jale, and Elisabeth Alföldi-Rosenbaum. Römische und frühbyzantinische Porträtplastik aus der Türkei: neue Funde. (Mainz am Rhein : von Zabern, 1979), pp. 69-70, no. 16; pls. 13.3-4; 14.2-3. Vierneisel, Klaus, and Paul Zanker. Die Bildnisse des Augustus: Herrscherbild und Politik im kaiserlichen Rom (ex. cat. ), Glyptotek Muenchen, December 1978-March 1979; Antikenmuseum Berlin, April-June 1979. Munich: 1979, p. 96, cat. no. 10.7, ill.
Jucker, Hans. "Iulisch-claudische Kaiser- und Prinzenporträts als `Palimpseste´." Jahrbuch des Deutschen Archäologischen Instituts 96 (1981), p. 276. Frel, Jirí. In collaboration with Sandra Knudsen Morgan. Roman Portraits in the Getty Museum. Exh. cat. for "Caesars and Citizens," Philbrook Art Center, Tulsa, Oklahoma, April 26-July 12, 1981, pp. 38-39, 123, no. 24, ill.
Massner Ann-Kathrein. Bildnisangleichung: Untersuchung zur Entstehungs- und Wirkungsgeschichte der Augustusporträts (43 v. Chr. - 68 n. Chr.) Das römische Herrscherbild IV. (Berlin: Gebr. Mann Verlag, 1982), pp.113, 125, pl. 30d, 31a. Hertel, Dieter. "Caligula-Bildnisse vom Typus Fasanerie in Spanien. Ein archäologischer Beitrag zur Geschichte des Kaisers Caius." Madrider Mitteilungen 23 (1982), p. 272, no. 24. Chamay, Jacques, Jiřì Frel, and Jean-Louis Maier. Le monde des Césars: Portraits romains (Geneva: Musée d'art et d'histoire de Genève 1982), p. 87; pls. 13a-b. Pollini, John, "A Pre-Principate Portrait of Gaius (Caligula)?" Journal of the Walters Art Gallery, vol. 40, 1982, pp. 1-12, pp. 4,6-7, ill. fig. 11. Fittschen, Klaus, and Paul Zanker. Katalog der römischen Porträts in den Capitolinischen Museen und den anderen kommunalen Sammlungen der Stadt Rom, I: Kaiser- und Prinzenbildnisse (Mainz: 1983, rev. 1994), 31, no. 23, n. 6. 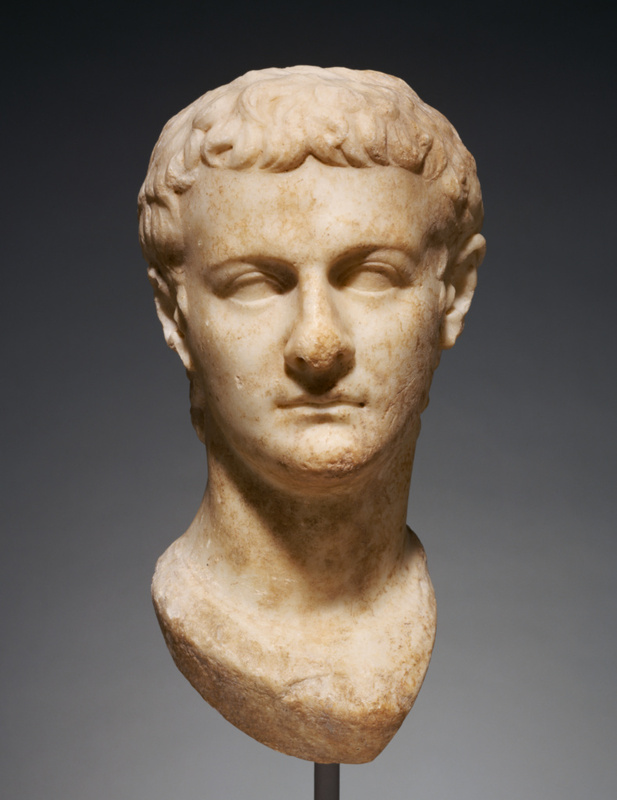 Johansen, Flemming S. "The Sculpted Portraits of Caligula," Ancient Portraits in the J. Paul Getty Museum, 1. Occasional Papers on Antiquities, 4 (1987), pp. 87-106, figs. 20a-b. Ancient Art from the V. G. Simkhovitch Collection (where cited as a comparison), 1988, p. 60 (comparanda). Barrett, Anthony. Caligula. The Corruption of Power. London: 1989, fig. 7. Boschung, Dietrich. Die Bildnisse des Caligula, Das römische Herrscherbild I.4 (Berlin, 1989), pp. 29, note 12; 38-39, 53-57, 90, 110; cat. no. 12, fig. 12; pl. 12. Pollini, John. Roman Portraiture: Images of Character and Virtue, exhibition cat., Fisher Gallery, University of Southern California (Los Angeles, 1990), 11, fig. H.
The J. Paul Getty Museum Handbook of the Collections. 3rd ed. (Malibu: J. Paul Getty Museum, 1991), p. 24. Born, Hermann, and Klaus Stemmer. damnatio memoriae: Das Berliner Nero-Portraet. Sammlung Axel Guttmann 5. Mainz: Verlag Sammlung Guttmann bei Philipp von Zabern, 1996, p. 77 fig. 41 (after the plaster cast in Berlin, Abguss-Sammlung Antiker Plastik). The J. Paul Getty Museum Handbook of the Collections. 4th ed. (Los Angeles: J. Paul Getty Museum, 1997), p. 25. Towne Markus, Elana. Masterpieces of the J. Paul Getty Museum: Antiquities. (Los Angeles: J. Paul Getty Museum, 1997), p. 108. Varner, Eric R., ed. From Caligula to Constantine. Tyranny and Transformation in Roman Portraiture. Exh. cat., Michael C. Carlos Museum, September 16, 2000-January 7, 2001; Yale University Art Gallery, January 31-March 25, 2001. Atlanta: 2000, pp. 96-99, cat. no. 4. The J. Paul Getty Museum Handbook of the Collections. 6th ed. (Los Angeles: J. Paul Getty Museum, 2001), p. 25. The J. Paul Getty Museum Handbook of the Antiquities Collection (Los Angeles: 2002), p. 157. Varner, Eric R. Mutilation and Transformation. Damnatio Memoriae and Roman Imperial Portraiture (Leiden and Boston: Brill, 2004), pp. 36-37, 225, fig. 27. Spivey, Nigel and Squire, Michael. Panorama of the Classical World (Los Angeles: Getty Publications, 2004), p. 184, fig. 292. Maderna, Caterina. "Die Bildhauerkunst während der Regierungszeit des Caligula (37-41 n.Chr.)" In Die Geschichte der antiken Bildhauerkunst IV. Die Plastik der römischen Kaiserzeit bis zum Tode Kaiser Hadrians. Peter C. Bol, ed. (Mainz: Zabern, 2010), pp. 56, 305, no. 81, pl. 81a-b. The J. Paul Getty Museum Handbook of the Antiquities Collection. Rev. ed. (Los Angeles: J. Paul Getty Museum, 2010), p. 154. Pollini, John, with William Storage. "Recutting Roman Portraits: Problems in Interpretation and the New Technology in Finding Possible Solutions." Memoirs of the American Academy in Rome 55 (2010), p. 40, p.79, fig. 31, p.92, pl.3-5.